Woven Jacquard blanket perfect for indoors or out. Unique finishing process creates a finish that won't shrink or pill. Promises delivered by Grommet. I always feel confident quality will be as described. This blanket is so soft! It was a wonderful wedding gift and its perfect to curl up on the couch with. This Grommet comes with a warning: One snuggle and you’ll be hooked. 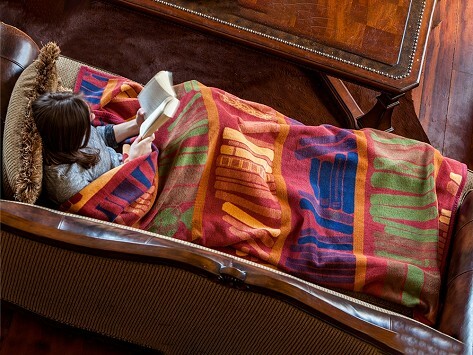 This cozy woven blanket will quickly become the one everyone in the family tries to grab, whether you’re tailgating, watching the sun set on a crisp autumn night, or just curling up on the couch. That was the goal of Beth Haller LaSala, who had fond memories of her own go-everywhere blanket and enlisted the help of her daughter, Christina, to create a timeless replacement, called ChappyWrap. LaSala found a manufacturer in Germany with a special Jacquard loom. Their designs are woven into the material—not printed on the fabric—and the colors reverse for a double sided design. After each blanket comes off the loom, it goes through a series of napping machines that fluff up and shear down the surface until the perfect texture is achieved. This special finishing process creates a soft, brushed finish that won’t pill. It’s luxuriously cozy yet durable enough for indoor and outdoor use. ChappyWrap styles are fun and upbeat with vibrant colors. There’s something for everyone, from animal prints and sports themes to outdoor and nautical patterns. Everyone will want their own, and they’ll treasure it for a lifetime.